When it comes to sourcing and recruiting, you should not ignore the potential of Facebook given that it has 1.38B monthly active users and 890M daily active users. Also, you should know that according to Jobvite’s 2014 Job Seeker Nation Report, 76% of social job seekers found their current position through Facebook. 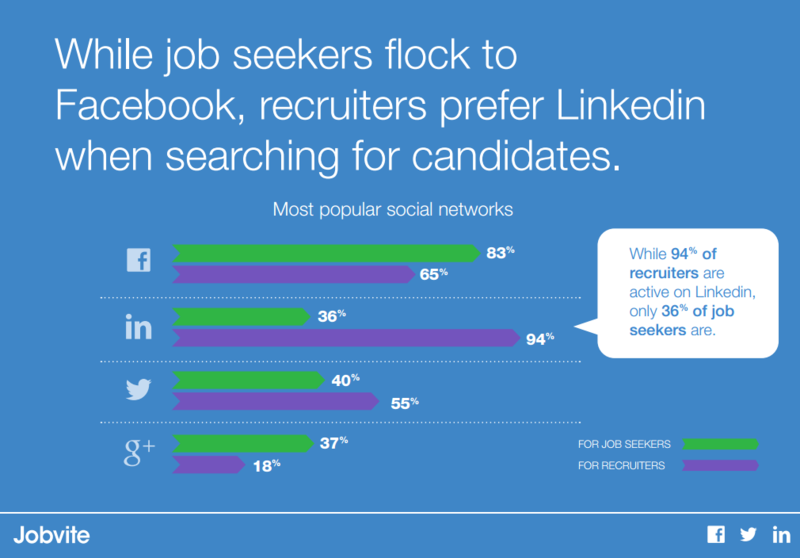 Jobvite also found that while job seekers flock to Facebook, recruiters prefer LinkedIn when searching for potential candidates. That’s understandable, as LinkedIn is a professional social network and some profiles are as detailed as resumes. While Facebook users seem to be adding more professional information on a daily basis, that information is quite limited. As I’ve written recently, even though Facebook’s Graph Search isn’t as powerful as it once was, finding people to recruit on Facebook is remarkably easy. If you want even more information on using Facebook to find people, check out Todd Davis’ Ultimate Guide to Sourcing and Recruiting on Facebook. However, one thing that isn’t being written about much is using Facebook to reach out to potential candidates. Some people simply may not know all of the ways you can message people on Facebook (there is more than meets the eye, as you will see), and many sourcers and recruiters seem to get caught up on thinking that people will be “weirded out” by getting messages from them on Facebook – I’ll be addressing this as well. Facebook once had dreams of users flocking to use a @facebook.com email which everyone was assigned based on their username. You should know that in February of 2014, Facebook decided to kill their email service due to low user numbers. 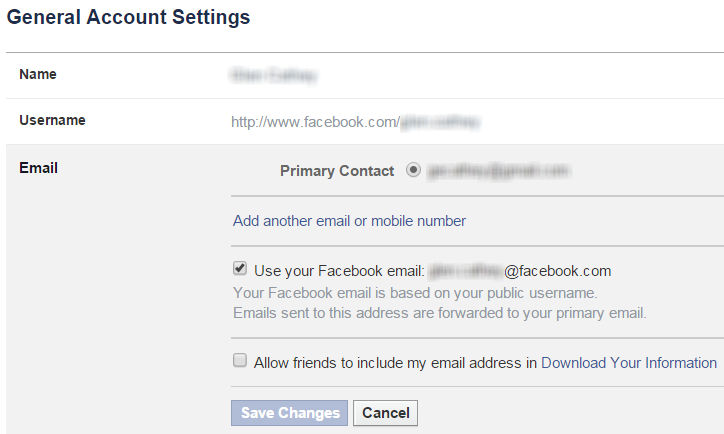 If you now send an email to someone’s @facebook.com email address, that email will be rerouted to the email address the user have when they signed up. In theory, you should be able to send an email to any Facebook user and it will show up in their personal email inbox (e.g., Gmail). This sounds fantastic, right? Unfortunately, the reality isn’t as exciting. A Facebook spokesperson told Mashable that they “limit the number of messages a person can receive in their inbox from people they’re not connected to,” and that Facebook also has “systems in place to detect spam, and will not forward messages that we think are spam. The external email provider will also do their own spam checks.” Furthermore, people also have the ability to turn off email forwarding – click the image below to be taken to where this can be disabled. Now, most people aren’t even aware that they ever had a @facebook.com email address, so they aren’t likely to go turning off @facebook.com email forwarding. However, in my testing, sending emails to @facebook.com email addresses from Outlook rarely works, and Gmail tends to snag the incoming emails as spam – from people who are my friends, friends of friends, and people with whom I have no connections. If you have found a consistently reliable way to ensure emails to @facebook.com email addresses actually get through to the intended recipient’s inbox, please share. Regardless, this is always worth a shot as it’s free and easy. You can actually send a message to anyone on Facebook – it just might not ever get seen unless you pay (or unless you keep reading). For example, if you try and send a message to someone you’re not connected to, your message will likely end up in the person’s Other folder, where pretty much no one ever goes, because people aren’t notified of messages that go there, and most people don’t even know there is an Other folder. 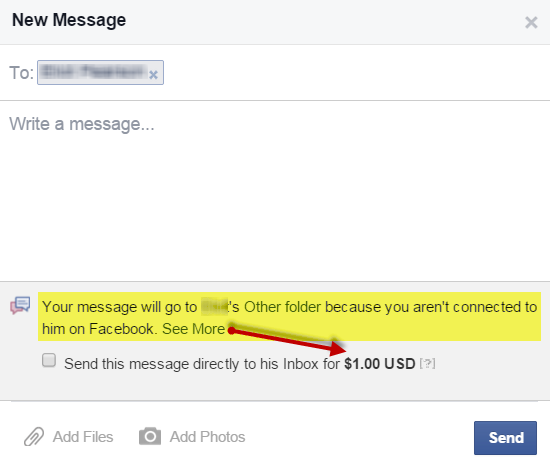 To avoid the dreaded Other folder, you might have the option to pay to send a message to someone’s primary inbox. In the U.S., it appears to cost $1.00 for you to send a message to someone who you aren’t connected to in any way. When you think about it, $1.00 isn’t much money to pay to ensure that you get a message to someone’s primary Facebook inbox – it’s the same cost to send an email to a person on Indeed from a resume search. Although LinkedIn’s pricing doesn’t really reveal the cost per-InMail, most would agree that it would come out to be significantly more than $1.00 each, so the ability to get a message to almost anyone’s primary inbox on Facebook, a social network with 3-4X the global users of LinkedIn, for $1.00 is a bargain by most standards. 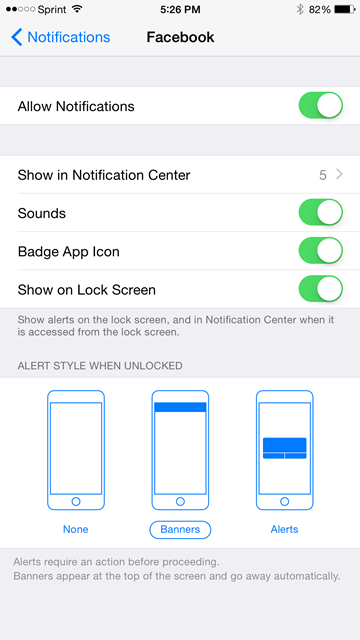 Furthermore, depending on the user’s account settings, your message could show up on their mobile phone as a notification, even on their lock screen, which would be awesome and much more likely to be seen than an email. I’ve received multiple messages to my primary Facebook inbox from people who I wasn’t connected to in any way, other than being in the same (non-recruiting) group. This has led me to believe that, depending on the user’s “Whose messages do I want filtered into my Inbox?” settings in Facebook, you are likely to be able to get messages through to the primary Facebook inbox of people with whom you share a group without having to pay. As you can see from my settings, I’ve chosen “Basic Filtering,” so perhaps the reason why people with whom I have no connection with, other than sharing a Facebook group, can send me messages that show up as a notification and in my primary inbox. My guess is that Facebook considers other group members as people I might know. At this point, I am not sure if this extends to liking the same Pages, but my guess is that would be a much weaker tie to whether or not I might know someone, at least in Facebook’s eyes. I haven’t tested it yet, but I suspect if I changed my setting to “Strict Filtering” that those same people might not be able to get messages to my primary inbox. But What Do I Say to People? It seems that the majority of sourcers and recruiters I encounter don’t feel comfortable using Facebook as a means to reach out to potential candidates. I can imagine why – most people associate Facebook as a personal and not a professional social network, and many also feel that Facebook is somehow “private,” making it awkward as a place to reach out to people you don’t know. However, I would not let any of these notions stop you from using Facebook to reach out to someone if you have no other readily available means of doing so. To assume that someone would respond negatively to being reached out to by a recruiter on Facebook is exactly that – an assumption. In fact, I know a recruiter that as far back as 6 years ago was making hires consistently on a monthly basis that he accredited to Facebook – he would first find people on LinkedIn, and because he did not have a premium account and was unable to send them InMails, he would simply cross reference people on Facebook and send them a message. I don’t recall him ever mentioning a single negative response. This is also a really interesting example because of the source attribution. Which was more valuable – the ability to find the person, or the ability to effectively connect with them? My advice is to not overthink the issue – simply think about what kind of message you would respond to positively, or at the very least not negatively to. You can even (gasp) ask your candidates what kind of messaging they would respond to positively on Facebook. I know – crazy idea, right? You might be interested to know that I’ll be asking a panel of I.T. professionals this and many more questions about what it’s like to be sourced/recruited at the March 24/25 SourceCon even in Seattle – I’m really looking forward to it! Just to get you thinking along the right path, a common approach of mine is to first apologize for reaching out to people on Facebook. If you’re concerned that the person might feel that Facebook is “private,” show some understanding of and respect for this by recognizing it and apologizing, then letting them know why you’re trying to contact them, and then ask for the best way to continue to communicate with them outside of Facebook. Yes, it can be that simple! Is it really that much different than striking up a conversation with someone you see in an elevator (or lobby, restaurant, etc.) that you can tell works at a company you recruit from (employee badge, etc.)? Another tactic I suggest is to use a subject line. While Facebook messages don’t have a specific space for a subject line, you can easily use the first line of the message as you would a subject line, spacing out the rest of your message from the “subject line” by a blank line – this can make your recruiting message be quickly and easily identified as such, rather than confusing the person or triggering a negative response that can be attributed to strangers reaching out to them on Facebook. Your first line and how it’s presented is essentially your opportunity to make a first impression – it sets the tone for the rest of the message, so put some serious thought into it. To say the least, I think it’s extremely limiting to not leverage the largest social network in the world to reach out to potential candidates, whether you can find a way to message people on Facebook for free or if you have to pay $1.00. I’d be happy to hear your concerns and/or experiences in using Facebook to reach out to potential candidates. Leave a comment if you’re so inclined – I’m sure there are many others who would also appreciate your thoughts!